Nich Steinkraus, a landscape designer with Merritt Chase, climbs the 54th Street Steps overlooking Upper Lawrenceville. Image courtesy Merritt Chase. This comes as no surprise to Chase, who calls the stairs “very Pittsburgh.” While the city has been focused on building up a comprehensive data set on its stairs, Chase has started to imagine an expanded role for these vital pieces of Pittsburgh’s pedestrian network. Together with Chris Merritt, her partner in the local landscape architecture practice Merritt Chase, she has begun investigating ways to layer functions such as recreation, play, performance, and green infrastructure in these narrow corridors in the hope of broadening ideas about public space in the city. “We’re always looking for opportunities to insert landscape architects into the conversation around things that might just be thought of as infrastructure,” Chase says. Chase and Merritt launched their practice roughly a year ago, energized by the fact that “there are a lot of really hearty, robust conversations around equity” now happening as smaller cities start to reverse years of stagnant or declining growth, Chase says. Earlier this year, Pittsburgh emerged from Act 47, the Pennsylvania state recovery plan for distressed municipalities it had been operating under for 14 years. As the city shifts its focus from stabilization toward investment, Merritt Chase is taking on a proactive role in seeking out the types of projects that can help make it a more socially equitable place. A set of steps on Joncaire Street is the only staircase the city has been able to completely reconstruct in recent years. Photo by Pat Hassett. Chase says that through regular use, the firm started to form ideas about the stairs becoming more than just connectors, and began informally talking to others in the community about the ways in which they experienced them. “Some of these places are just total examples of the urban sublime,” Merritt says. 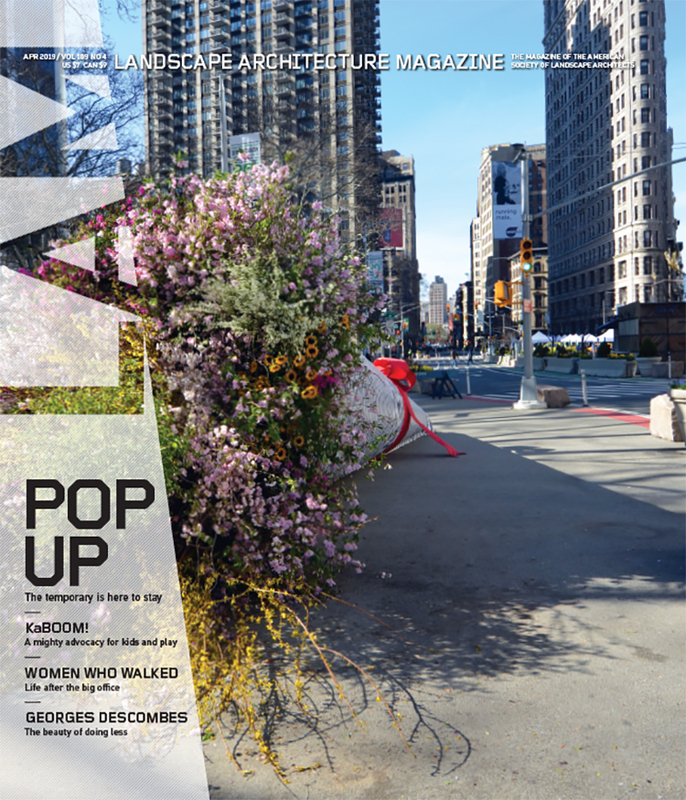 These informal conversations led to something more concrete: The editor of the local magazine Beaux Arts expressed interest in a set of steps in the Uptown neighborhood that had been identified as a key connectivity element in a recent planning document and wanted to feature them in the magazine. He asked Merritt Chase to share some ideas for publication in an upcoming issue. For the firm, it was an ideal opportunity to be aspirational about what the stairs could become. “We started thinking, what if there was an opportunity with these priority steps? Could you leverage the money that the city is getting for those priority step replacements and think about the steps in a broader sense?” Chase asks. The idea was to pitch them as small vertical parks that could help address some of the city’s equitable connectivity, open space, and green infrastructure challenges. Chase and Merritt started sketching and developed a concept of reconfiguring the basic physical building blocks of the stairs—precast concrete and metal piping—into a range of community-centric enhancements such as picnic tables, fitness courses, bird blinds, and performance stages. “[The stairs] are incredibly utilitarian, both in their function and also in their construction,” Chase says. “They’re so wonky and weird and wonderful.” In the colorful axonometric renderings produced for the magazine, Merritt Chase’s proposals consciously built on that character to show the stairs working effectively as both access and destination. Chase says that she sees their design work as complementary to the city’s mammoth task of rehabilitating stairs that have fallen into disrepair. Because of the logistical challenges relating to access on Pittsburgh’s steep slopes, only one set of steps on Joncaire Street in Oakland has been fully rebuilt in recent years, and that project cost roughly $750,000, excluding engineering and construction administration. “We definitely have some deferred maintenance issues,” Saunders says. The city has now been able to prioritize about 150 “top steps” for attention. Above and below: Merritt Chase imagined the stairs reconfigured to create adjacent community amenities. Images courtesy Merritt Chase. Chase is clear-eyed about the city’s budget challenges, but because she understands the municipal decision-making process she also sees great potential for landscape architects to help communities get creative projects off the ground and into the public eye. She points out that compelling renderings and narratives can be critical tools in attracting funding, enthusiasm, and support. “It’s about projecting alternative futures and our skill set as landscape architects to be able to communicate visually the potential for some of these places,” she says. As colleagues at Sasaki, Chase and Merritt were part of a research team at the firm looking at sea-level rise and its impacts on Boston. In 2013, shortly after Hurricane Sandy narrowly missed the city, they noticed that there weren’t yet a lot of designers discussing landscape-based solutions. What there was plenty of, however, was research from scientists, academics, and nonprofits. The Sasaki team decided to try and translate some of that material for the public. Partnering with the city and the Boston Harbor Association, they put together a symposium, exhibit, and summary body of research called Sea Change: Boston with the aim of kick-starting conversations between designers, city officials, developers, and academia. For Chase, the experience was revelatory: “The fact that we can create images to show what different futures could look like goes so much further than just talking about solutions,” she says. Soon after, Sasaki was appointed to work on the climate action plan for the City of Boston, which went on to initiate a host of projects that landscape architects are now working on across the city. The experience impressed upon both Merritt and Chase the critical role landscape architecture has to play in local activism. “I couldn’t believe how quickly people saw the ideas and got excited about them and change started to happen,” Chase says. With these lessons in mind, Merritt and Chase have been taking their visuals to nonprofits and foundations across the city focused on open space, connectivity, and green infrastructure and advocating for the potential of the stairs as a uniquely Pittsburgh cultural amenity. They are framing their initial proposals as a sort of kit of parts that could be selected from or combined based on a particular set of steps’ surrounding conditions and its neighborhood’s assets and needs. Left to right: a typical existing stair condition; a proposed design for typical stairs; a “vertical park” that integrates existing Uptown stairs with adjacent vacant land. Image courtesy Merritt Chase. Lesley Perez, Associate ASLA, is a landscape designer with DLANDstudio in Brooklyn, New York.